My people in Los Angeles, are you ready to get your comedy on? 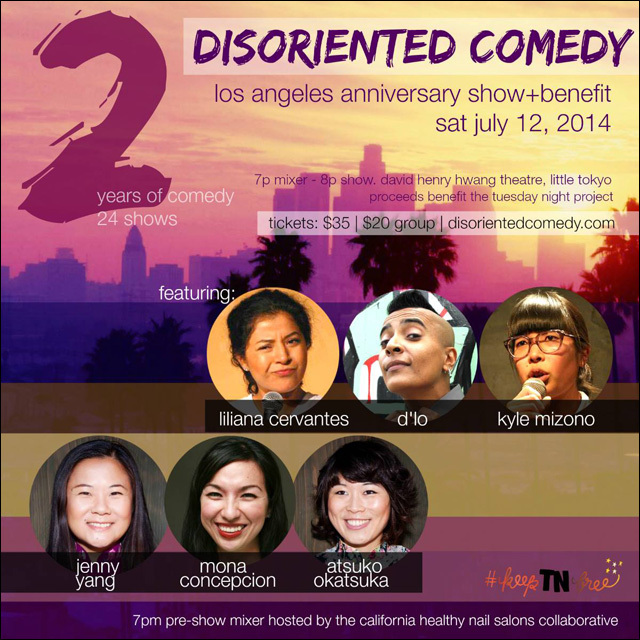 Dis/orient/ed Comedy, is bringing their first-ever all female (mostly), Asian American stand up comedy tour back home to Los Angeles for their two-year anniversary show, happening Saturday, July 12 at the David Henry Hwang Theatre in Little Tokyo. The evening's lineup includes Liliana Cervantes, Mona Concepcion, Kyle Mizono, D'Lo, Atsuko Okatsuka and Jenny Yang. All proceeds will benefit Tuesday Night Project. Want discount tickets? Of course you do. Use the promotional code STAYANGRY to get five bucks off your ticket. INVITE YOUR LOS ANGELES FRIENDS! Group Tickets available for $20 per ticket for groups of 10 or more! You can order your tickets here. Remember to use that discount code to get $5 off -- it expires Tuesday, July 8 at 11:55pm. For further information about the July 12 show, check out the Facebook event. See you there.